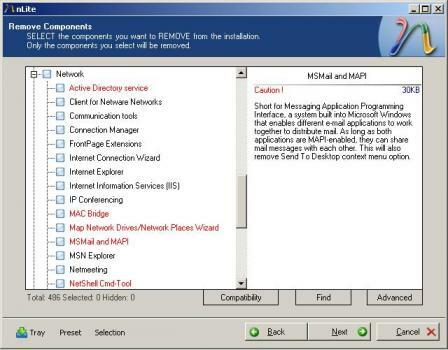 nLite is a free tool that allows removal of Windows components, such as Media Player, Internet Explorer, Outlook Express, MSN Explorer…etc., before and after installing Windows OS. nLite enables you to create customized CDs of Microsoft Windows XP, 2000 and Server 2003. You can choose to skip install for Windows components you don’t need and integrate service packs and hotfixes from Microsoft into your Windows distribution files. Additionally nLite provides customization options for post-install Windows appearance and functionality. After performing all necessary settings to customize your Windows distribution files, nLite provides an option to make a bootable image, which you can burn on a CD or test in virtual machines.